We didn’t really try to push our game Sling Ming, although we had a demo ready in case somebody just happened to be interested. This didn’t happen of course – we only showed it to people we knew. Lesson learned: if you want to show your game you better sign up for the Pitch & Match or aggressively throw your game in the face of strangers (although chances are they are developers just like you). The custom t-shirts we had printed seemed to be a success. One guy started asking about the logo because he had seen it on three or four people. Which is funny because we are only two guys. Nonetheless, that’s one conversation started right there. In the end he was mostly interested in pitching his audio solution to us, but whatever. He’s a good salesperson, we are definitely not! Indie, triple-A, casual, mobile, consoles, web, VR, kickstarter and business models up the wazoo. It feels like the games industry is shattered into a million pieces. Everybody has chosen a strategy and is working really hard at succeeding with it, while secretly fearing that they are betting on the wrong horse and it’s actually one of all the other strategies that is the ”correct” one. Everything is polarized, black and white, win or lose. It’s a lottery where the winners become filthy rich and the rest are left behind, bitter and jealous. If you win, be sure to evangelize your business model, as if you somehow knew beforehand that you would succeed. The games industry is growing and generating more money than ever. It’s a time to rejoice, to celebrate that the gaming culture is becoming mainstream, accepted and enjoyed by people all over the world. Instead there is talk about the games industry being killed by this or that or whatever. Ste Curran gave a spot-on talk called “Killing the Games Industry” about this. It’s on YouTube, dunno if that’s legal or not but look it up if you can, it’s a great talk! You know, when we grew up only geeks were interested in video games. This is changing, at least somewhat. As the game culture reaches a wider audience, a wider range of people enters the games industry, broadening the knowledge and experience which we as an industry can bring into our games. Looking at the crowd at Nordic Game, it really felt like a generation gap. In the younger crowd, the percentage of women attending was quite remarkable. Among the older people, not so much, although there were a few. The number of women speakers was embarrassingly low. This was somewhat compensated by the #1reasontobe panel where six female developers discussed their experience in the industry. It was highly emotional, but the consensus was that the Nordic work climate is fairly good, at least compared to other places. And as a female, you shouldn’t need to state a reason to be in this industry. Many talks touched upon story, how important it is and how to best tell a story: “République & The Fight For Narrative Games”, “It’s All About the Story: Creating the Music and Sound for Broken Age”, “LOVE ME, BABY – Quest for Emotional Design” and “Next-Gen Story Design: Immersive Process for Immersive Experience”, the last one winning the award for worst title ever. Not all games tell stories. That’s okay, they don’t have to – abstract action or puzzle games are popular and will continue to be so. But adding a story on top of a game can help with retention by giving players another reason to come back and play the game. Will the princess be rescued or will she die horribly? Probably the former, but perhaps not. Leah Hoyer argued that story was the most important reason to play, citing some survey without giving a proper reference. Number one or not, there’s no denying that story is important. Why, then, are so many game stories lackluster? A few reasons were touched upon. Firstly, storytelling in games is still regarded as secondary to gameplay. Secondly, you need an actual storyteller in charge, with mandate to push the story agenda. Thirdly, when money runs short, story is an easy thing to cut back on. That last point is interesting – it suggests that story is expensive to create, which it is if story is approached in a Hollywood manner. Creating cinematics with all the animation, voice-over and what-not that is needed demands a lot of work. The end result is a static, short piece of entertainment that is only interesting to watch once, if that. At the other end of the spectrum you have the sandbox games, not telling a specific story but instead leaving the storytelling in the hands of the player. There are nuggets of gold here – eliminating ludonarrative dissonance is one – but it’s a bit of a cop-out. The same argument can be used to argue that a pencil can tell every story known to man. Can we somehow find a middle ground between these opposites? Distilling the essence of story into a set of building blocks, then using these procedurally to build dynamic stories? It will be interesting to see what the future brings in terms of storytelling in games. It’s one of the more important challenges, but also one of the hardest and, depending on how you tell your story, potentially very expensive. Unity, unity, everywhere you look is unity. 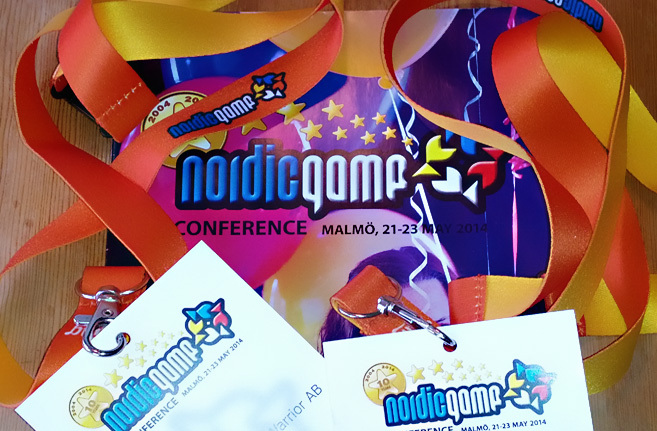 They might be the main sponsor of Nordic Game, but even if they weren’t, indie programmers would form small circles and chant Unity until early dawn. Unreal is trying real hard as well, although they have some catching up to do, at least among indies. Making such a statement is weird because Unreal used to own the game engine business. Is triple-A in such a bad state that Unreal must chase indies to survive? That Tappy Chicken is put forward as a showcase is strangely telling. Good, cheap game engines, especially Unity, have been immensely beneficial for countless small game studios. To be able to prototype quickly, not having to spend months (or years) building an engine, is a god-send. Add to that the ability to export to multiple platforms with the press of a button and you’re in heaven. No wonder that so many indies have put their eggs in that particular basket. The Unity basket is comfortable and luxurious. But to carry that basket with all those eggs, not tripping or falling, is a big responsibility. If you’re looking to pitch a game or get in contact with a publisher, Nordic Game has a section called Pitch & Match, through which you can set up meetings. This costs money of course. We cannot tell you if it’s worth it since we did not sign up for it, but we can say that there was no obvious way of getting in contact with publishers outside of Pitch & Match. The old drunken hello at a party might work, although as a business plan it seems risky. A couple of talks lifted the curtain enough to give a small glimpse of the business. The publisher panel was poorly moderated, mostly filled with hot air and cut short when approaching the juicy bits. Nonetheless, the panelists mentioned that they prefer to see a working demo of a game before getting involved. They absolutely want the IP rights. They also talked about how expensive it is to get players and how to best exploit them. Charming. The live pitch session was more entertaining, if only due to the developers on stage. Why anybody would want to put themselves through that is beyond me, but thanks for going through hellfire for our benefit. We are lousy at marketing and Good Night Brave Warrior probably didn’t gain that much from our trip but we had a good time and felt part of the Nordic gamedev scene. That’s a win in our book.